Figure 4.3: Transfer of an agent between from one server to another. Figure 4.3 gives a brief overview on how an agent is transfered from one server to the other. The neccessary actions are performed by the KaaribogaBase class and the agent itself. For a more detailed view let's assume base1 wants to send an agent to base2. This involves the following steps. base1 calls the kaariboga's onDispatch() method and stops it's thread. 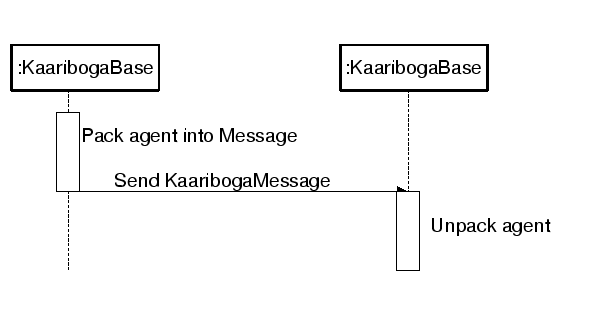 base1 sends a KAARIBOGA message to base2 which includes the agent's internal state. base2 checks if it has access to the java byte code of the class. If not it sends a GET_CLASS message to base1. If base1 receives a GET_CLASS message it sends a CLASS message including the byte code of the requested class. base2 initializes the class, calls the kaariboga's onArrival() method and starts it's thread.